Recently, Dutch supermarket chain Ekoplaza opened the world’s first plastic-free aisle in one of its stores in Amsterdam. This sent ripples through the food packaging industry, with environmental campaign groups calling for more supermarkets to follow the lead. Sian Sutherland, co-founder of one such group, A Plastic Planet, stated that, “for decades shoppers have been sold the lie that we can’t live without plastic in food and drink. A plastic-free aisle dispels all that”. While there’s been extensive talk about the environmental considerations of food manufacturing and packaging in the last 20 years, these conversations often focused on the carbon emissions and energy usage of food plants. However, since 2016, the world has increasingly grown to realise the environmental impact of plastics. Robert Glass, ABB’s global food and beverage communications manager, has commented on some of the alternatives. Some manufacturers will always require the malleability of plastics for their packaging. That is the reason why materials scientists have been actively developing biopolymer alternatives to serve as sustainable and safely biodegradable plastics. Most of these originate in by-products of other industries. Liquid wood is derived from lignin, a waste product created in paper processing, while other bioplastics are known to use casein from dairy production or keratin derived from chicken feathers from poultry farms. But by far the most popular are plant-based polymers, typical-ly from sugarcane or potato starch. The latter produces a material known as polylactic acid (PLA), which has many of the same properties as plastic but degrades far faster when exposed to nature, sometimes in as little as six months. Since the starch replaces the petroleum in the PLA, it produces less harmful chemicals during degradation. 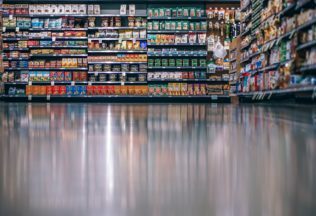 The launch of a plastic-free aisle reflects a wider consumer appetite to reduce the footprint and environmental impact of their food. To remain competitive in the future, food and beverage manufacturers should consider the same things. Glass has been a staple of the bottling industry for years, but plastic bottles have risen in popularity in the past few decades. While the price difference was initially the main driver for many manufacturers considering switching to plastics, it is likely there will be an industry shift back to glass in the coming years. Glass is advantageous because it is endlessly recyclable, meaning that it can be used, recycled and recovered repeatedly without a loss in quality or purity. This is in stark contrast to plastics, where the material fibers shorten with repeated recycling and become ineffective and unusable. With glass bottles, there’s also an element of consumer appeal. When global beverage brand Coca Cola brought back its glass bottles in 2014, it enjoyed an increase in sales. Architectures in China continue to develop innovative solutions to China’s lack of quality farmland. The Retail Food Group has just missed its revised forecasted net profit for its 2017 financial year. Gelatissimo and Byron Bay Cookie Company have collaborated to create a new gelato flavour.